How do you get to Carnegie Hall? Practice, practice, practice - and buy an apartment next door. 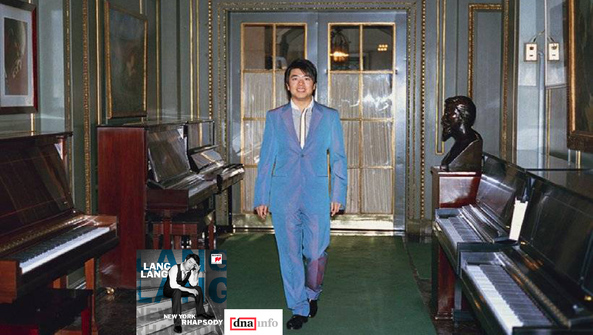 Superstar classical pianist Lang Lang, who was born in the small industrial town of Shenyang, China, now calls New York City home after buying an apartment that sits adjacent to the famous concert hall for $2.5 million in 2008, according to NYC Department of Finance records. The 34-year-old's latest album, which was released last week, is billed as a love letter to the city's musical heritage. "New York Rhapsody" features new arrangements of George Gershwin's "Rhapsody in Blue," Jay Z's "Empire State of Mind" and Leonard Bernstein's "Somewhere." A New York sightseeing double-decker bus will be dedicated in Lang Lang's honor Tuesday, in celebration of his role as the city's "first-ever" cultural tourism ambassador. (But what about Taylor Swift, you might ask? She was named a "global welcome ambassador" in 2014, a "once-in-a-lifetime position" coinciding with her move to the Big Apple, a spokesperson for the five borough's official destination marketing organization told us.) The city's tourism arm expects Lang's reputation to lure more visitors from China, where millions of children are said to play the piano as part of a phenomenon called "the Lang Lang effect."